Kelly Sweeney likes to call it the mouse that ate the elephant. Rarely does a company acquire a competitor nearly two-thirds its size. “You can’t always hold back and let the market dictate your actions; sometimes it pays to be proactive,” says Sweeney, CEO of Coldwell Banker Weir Manuel in downtown Birmingham. Since the acquisition last August — the former Weir Manuel Realtors had 2008 gross sales of $263 million, while then Coldwell Banker Schweitzer Real Estate Inc., in Sterling Heights, posted $722 million in gross sales — Sweeney has adopted the roles of Mr. Inside and Mr. Outside. Internally, Sweeney has cleared out $1.5 million on the expense side since the sale, while out in the community, the residential real-estate firm has gotten aggressive selling existing and bank-owned homes. But Sweeney has a few aces up his sleeve. Coldwell Banker’s ownership team includes foreclosure expert David Trott, president and managing partner of the law firm of Trott & Trott in Farmington Hills. While Trott’s law firm, which has 75 attorneys on staff, handles hundreds of foreclosures, new workout programs have been helping the market. There’s also veteran home-lending professional Tom Balames, who is putting together a mortgage origination firm and a title company to help round out Coldwell Banker’s offerings. Still, it won’t be a cakewalk. Home sales last year in the 10-county region were up 17.6 percent­ — to 68,886 units over 2008, while on-market inventory (active listings) dropped nearly 28 percent ­— to 37,608 units ­— during the same period, according to Realcomp II Ltd., a multiple listing service in Farm-ington Hills. The sales hike and inventory drop were both encouraging signs. 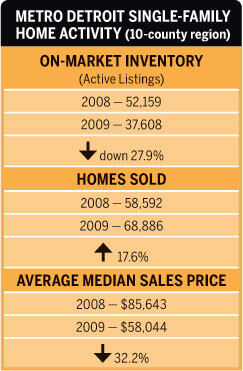 But home prices fell 32.2 percent, to $58,044, last year. Sweeney projects home prices will begin to rebound slowly once employment picks up.